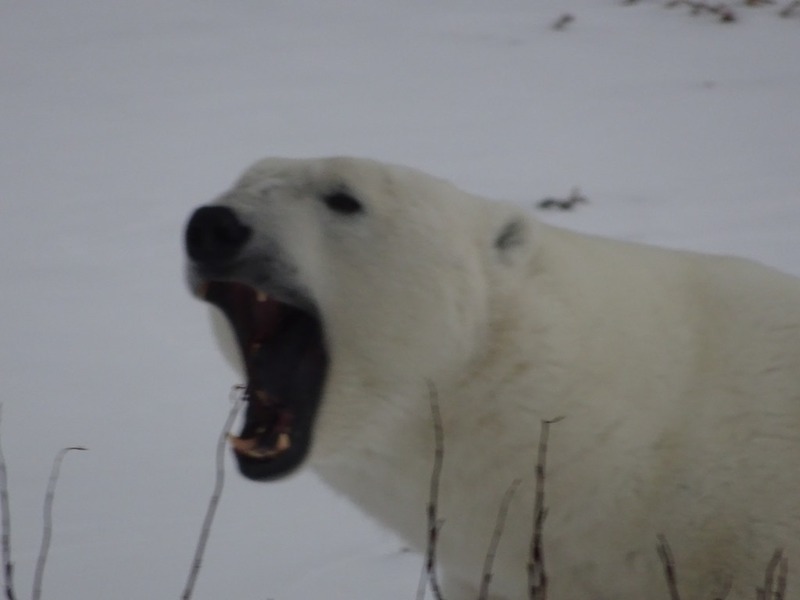 We spent three days in the Churchill Wildlife Management Area, a provincial park on the shore of the Hudson Bay in Manitoba Canada where polar bears accumulate to await the formation of the ice and the resultant opportunity to feed on the seals. The area is also next to the Wapusk National Park. This huge space is open only to scientists. 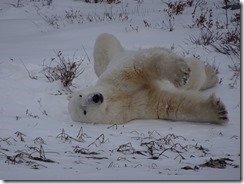 It is the largest known polar bear maternity den areas in the world. This is where female bears return every two years to give birth to and nurture their cubs for the two months before they take them onto to ice to teach them to hunt. Make no mistake. Polar bears are dangerous. So dangerous that we are not allowed to set our feet on mother earth the entire time we are in the wilderness. We moved from bus to lodgings on high ramps that bears can’t easily reach. When a human has to touch ground for some reason, multiple guards with rifles are dispatched as lookouts. 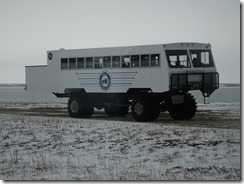 We spent most of our daylight hours roaming the wilderness area in mobile tundra buggies. These huge, roughly 15-by-45-foot vehicles have five-foot diameter tires and windows and back viewing deck that are about 11 feet above the ground—and a couple feet beyond paw reach of the largest bears. These slow, but very stable buggies maxed out at about 20 MPH and only covered about 15 km per day. Our very capable driver Neil skillfully drove around the frozen ground, occasionally getting mired down in a deep mud hole, but always finding a way out. 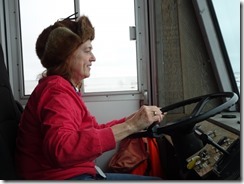 In between wildlife sightings, we were even allowed to “drive”…at least for a few feet. Each day, we helped Neil and Emma, our guide, spot wildlife. Neil would then try to position the buggy as close to the wildlife as possible. Polar Bears were our primary quarry and the focus of this blog. 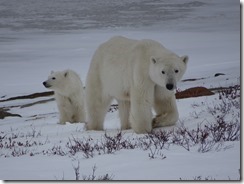 And boy did we see polar bears, starting on day one. 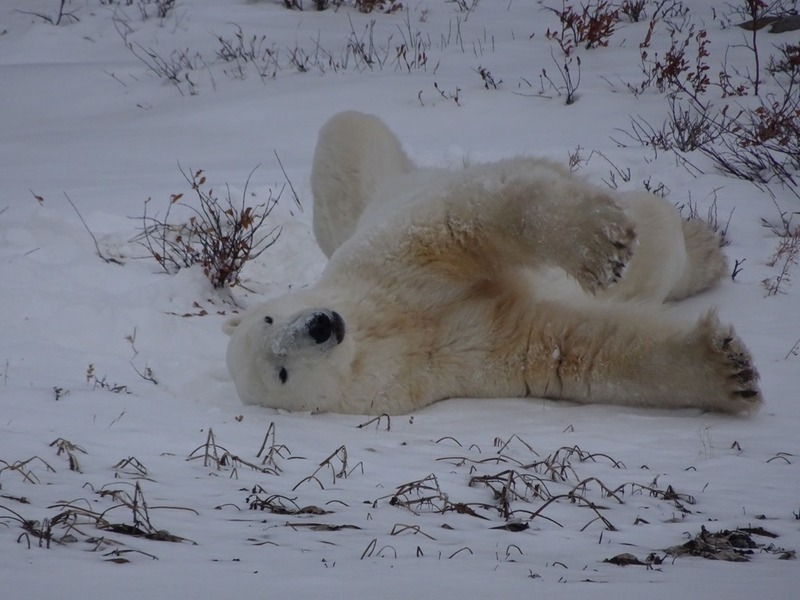 Dozens of them, of all ages, in all sizes and in all types of activities, from running, standing, washing themselves in the snow, scratching themselves in willow bushes, caring for their cubs, nuzzling each other, engaging in rigorous sparring matches and often, in the last months before resuming active hunting and feeding, just laying around, conserving energy. 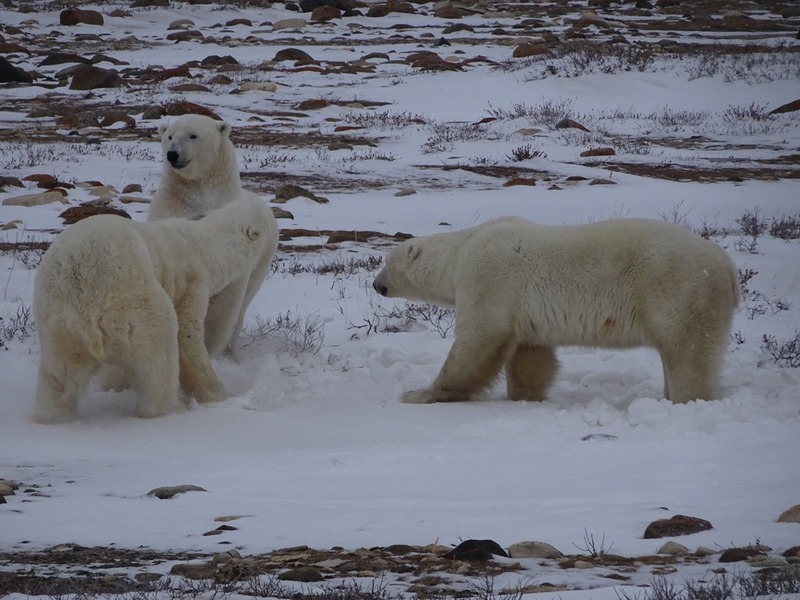 Most of the bears we saw were teens and adults of both sexes and of various sizes, from a handful of ten month-old cubs (born last season) to the largest males. 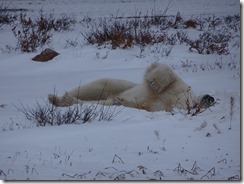 We saw bears walking, grazing, or just resting or sleeping. Some were in the distance; many however, were almost close enough to touch, were it not for the height of our buggy. We did, however, have a number of more unusual experiences. A number of bears walked up to us and carefully surveyed the buggy (and possibly us). 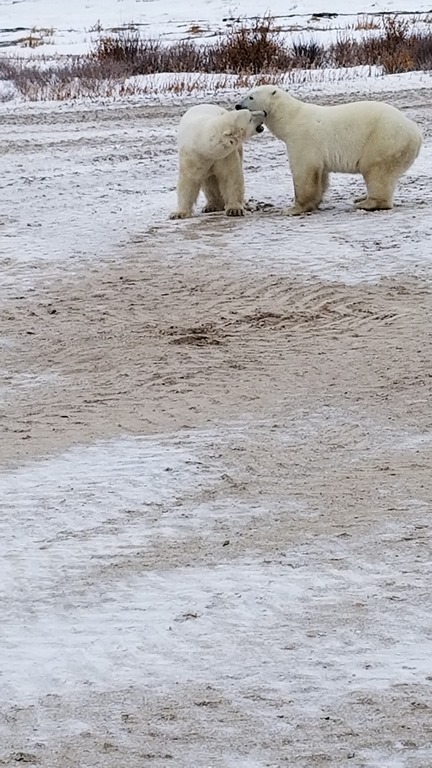 Occasionally, they would stand up next to our vehicle in an attempt to peer into our windows (which were purposely too high to allow them to do so). Some were swimming, some sitting up, almost as if watching a television program and others were rolling in the snow, scratching themselves against sharp willow bushes or stretching and assuming multiple yoga-like poses and exposing their bellies, their armpits and their groins to cool themselves off. 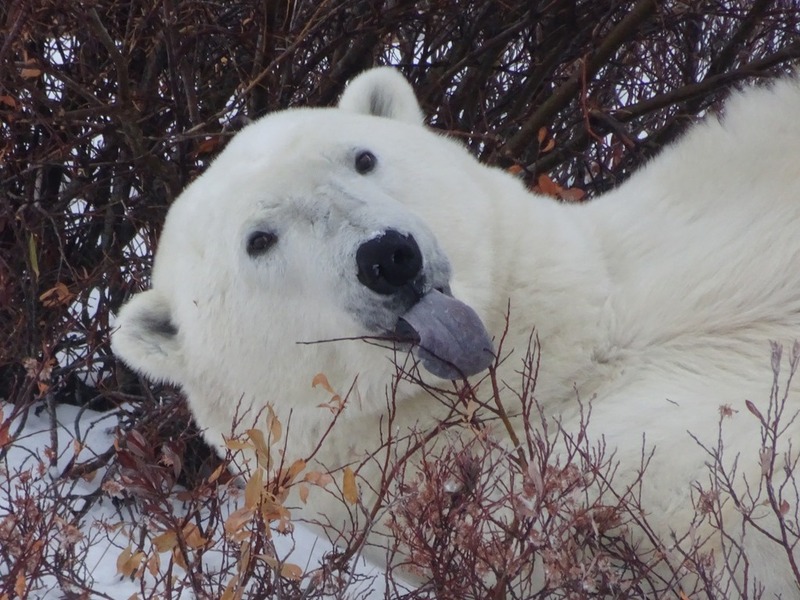 We experienced many yawns, a number of curious looks (although most bears just ignored us) and a few that just stuck out their long tongues (although not, we trust, at us). 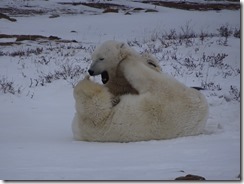 Even more unusual was seeing a mother followed closely by her roughly 10 month-old cub. Not only did the cub follow in its mother’s footsteps, it also mimicked Mom’s behavior, by sniffing the ground and eating a little kelp. 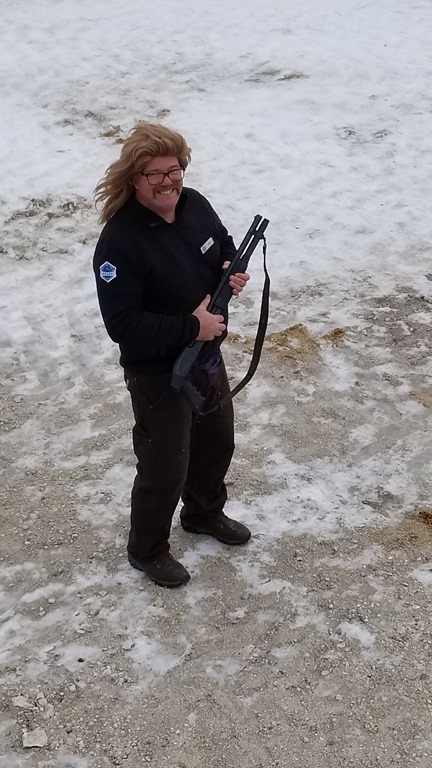 Not necessarily the type of behavior that will keep it alive, but a promising sign that it is learning a wider range of survival skills—hopefully including the hunting of seals—from its mother. 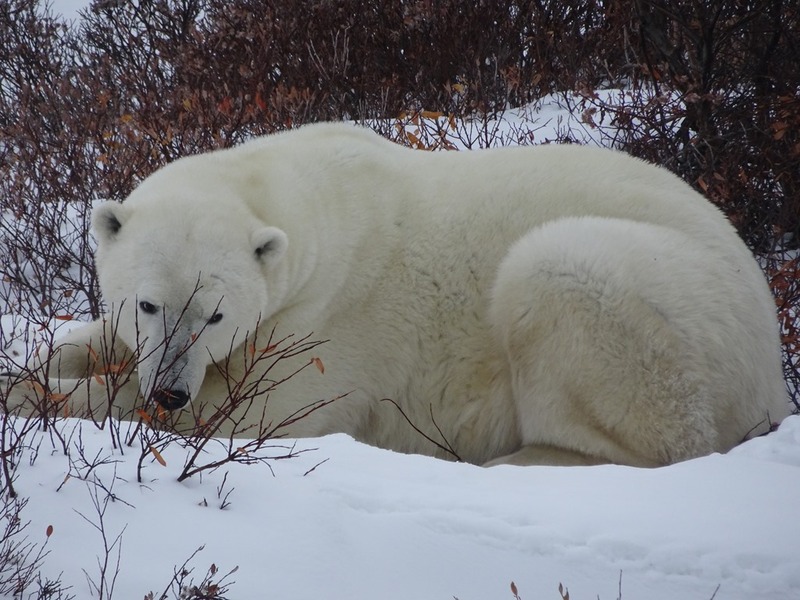 After all, the cub made it though its first winter and summer and appeared to be chubby and healthy going into feeding season. Certainly not a guarantee of long-term survival, but a hopeful sign. And this was just our first day! Our second morning found only a handful of bears. 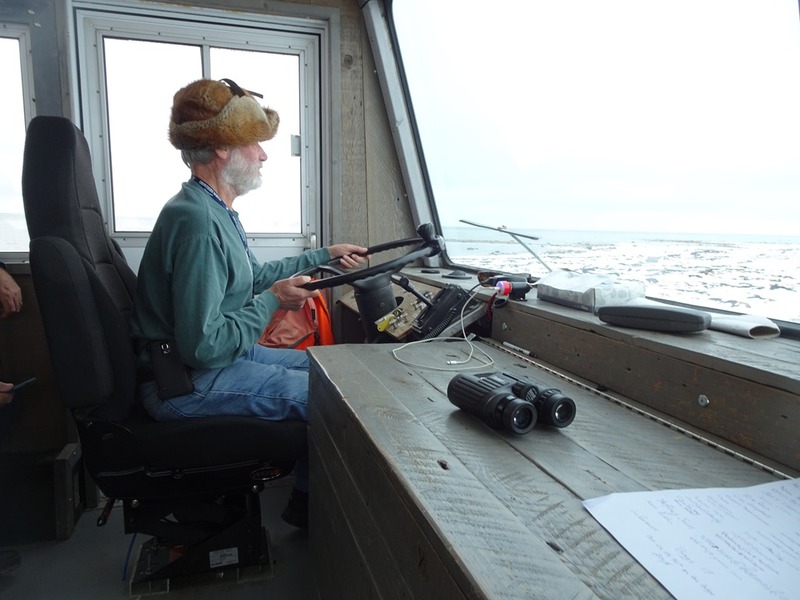 Most of them were either resting and had little incentive to move, or were so far away that they could only be discerned with binoculars or long-range lenses. 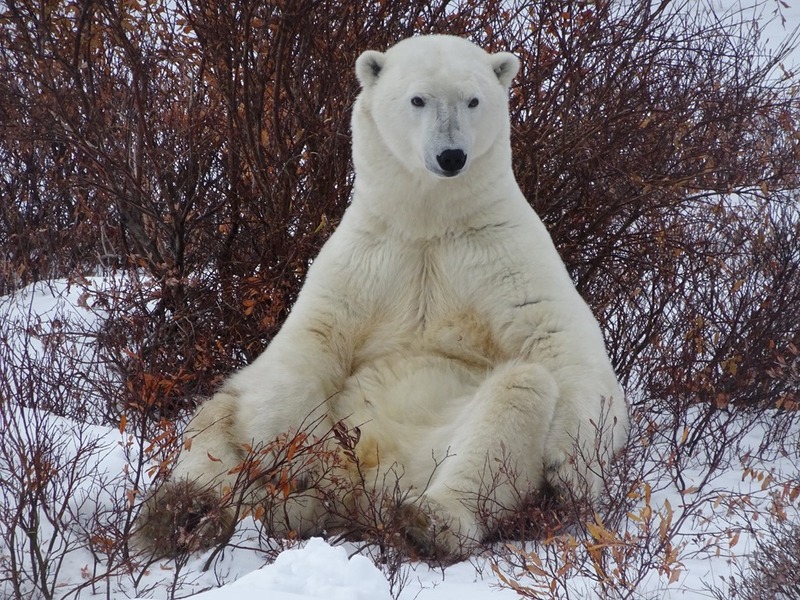 Still, we had some memorable experiences, such as a resting bear who became spooked by what appeared to be a smaller bear that was rambling, with no particular objective and in no hurry, in the direction of the other. 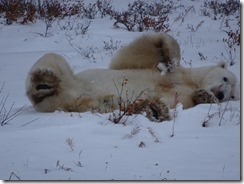 The resting bear, not waiting for the rambler to even get close, didn’t walk, but ran in another direction. Why was he so spooked by smaller bear that was a couple hundreds of yards away? We will never now. 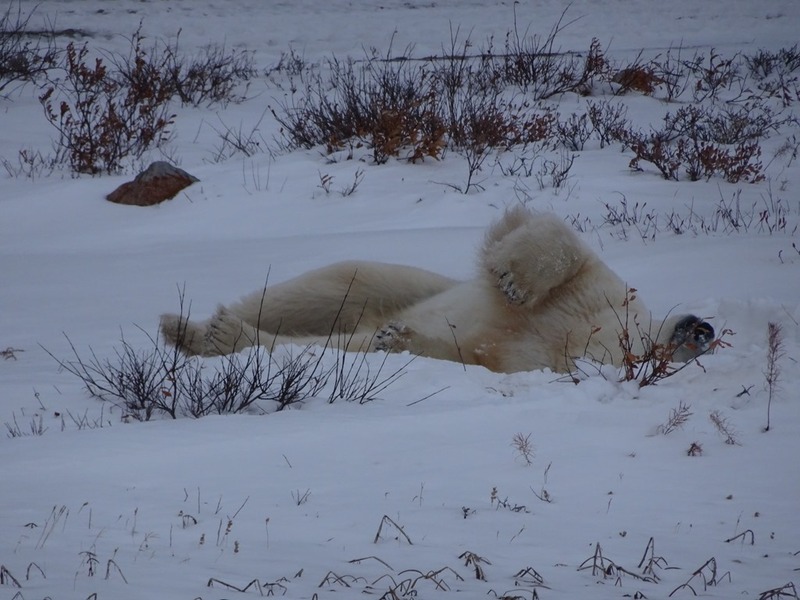 A large adult male rolling over and over in the snow, cleaning his fur and having what appeared to be a grand old time stretching, scratching and otherwise carrying on. His hygiene routine completed, he came to explore his surroundings—that being us. 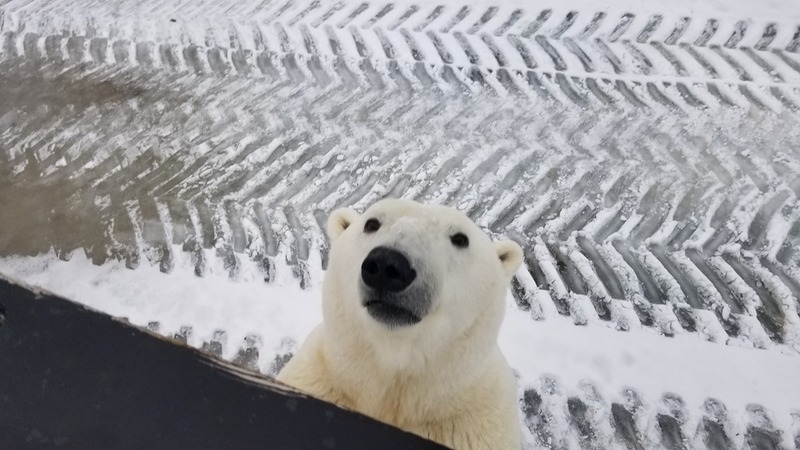 He walked up to our buggy, walked around and looking in, When he found something or someone particularly interesting, he went up on his hind legs to take a closer look. Then, as if to figure out what made this beast buggy run, he walked beneath the back viewing deck, staring as intently at us, as we were at him. Then, after getting his fill, he backed off, took another quick survey of the situation before ambling away. Nor did our discoveries end there. Next a pair of ptarmigans, then an arctic hare, both blending almost imperceptibly into the slowly landscape, other than for their black eyes and, in the case of the ptarmigan, black beak (our next blog has a discussion of these and other subarctic animals). We returned to our buggy lodge for drinks and dinner, thinking it would be the end of the day’s activity. It didn’t work out that way. Wrong. 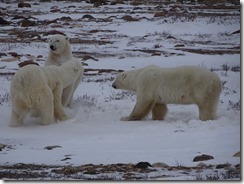 A steady stream of bears circled the outside lighted area of the lodge with one passing by our window every few minutes. The real activity, however, didn’t begin until after 9:30 when most of us had left the room and retreated to our bunks. After a while, we were called to the windows and the observation decks. 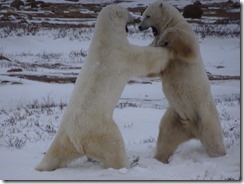 Two large, Alpha Males in training had begun to spar. Unfortunately, our camera did not do a good job of capturing this event. While these autumn/early winter sparring matches are casual and virtually never result in serious injury, they are actually preparations for much more consequential and brutal battles that occur in the spring. 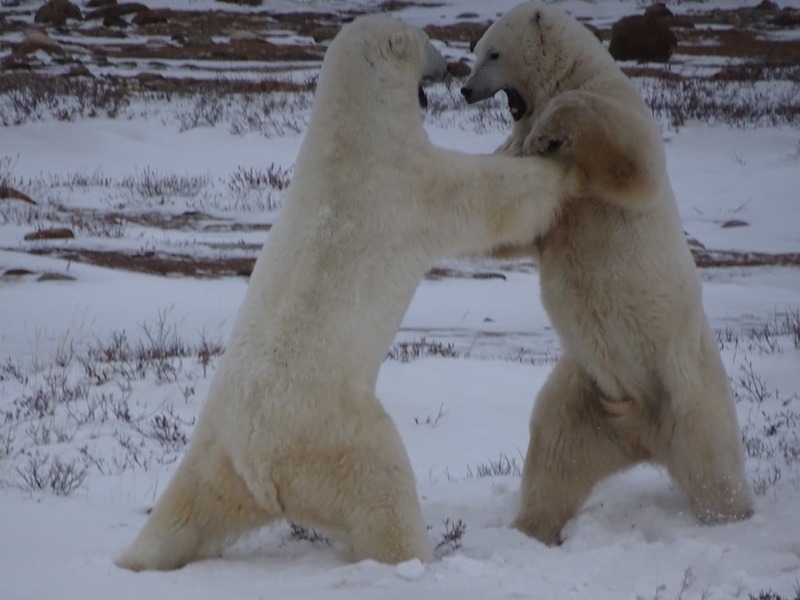 Sparring helps males hone their fighting skills and helps them assess their capabilities relative to other males. They serve as critical preparation for the spring mating season where the victor wins a chance to mate with preferred females. At best, the loser has to settle for a lesser, or even no female for the season. Worst case, they may suffer a serious injury, such as a dislocated shoulder or a broken jaw. Not only will such as injury jeopardize its mating prospects, it can often reduce their effectiveness in catching seals and end in death by starvation. 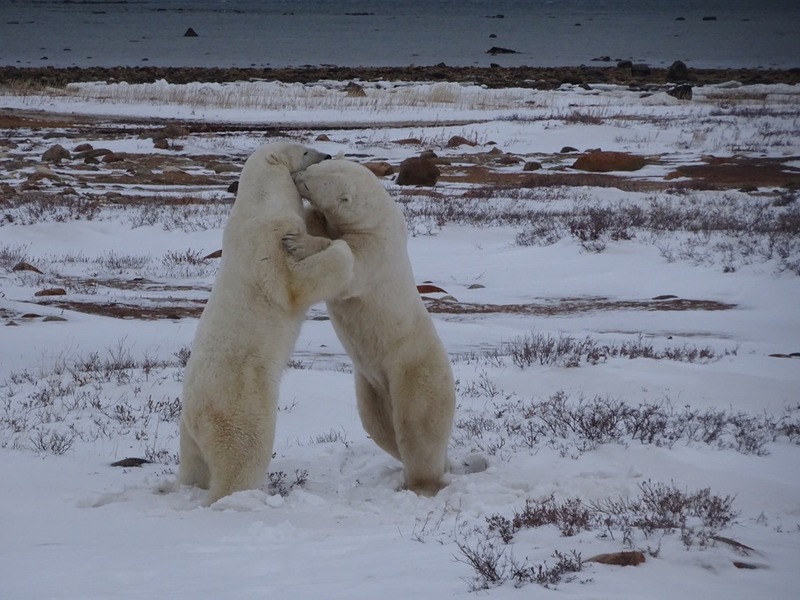 In these “trial” sparring contests, the males go through the motions of a fight, with each standing on its hind legs before pounding into each other with loud thuds and grunts that we could hear from more than 100 yards away. They wrestled each other to and on the ground until each, overheated from the exertion, paused for a rest. After a few minutes, the process repeated, with progressively longer rests for more than an hour. Our guide explained that these rests, regardless of how long they lasted, did not mark the end of the match. It would continue until one of the bears walked away. Although the bears remained, most of us gradually retreated to our bunks in preparation for the next early morning. 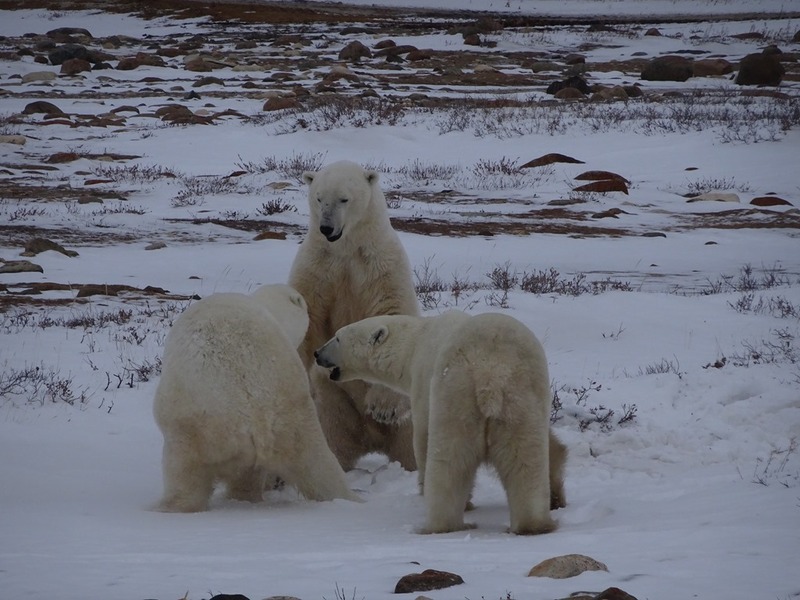 It was only the next morning that we learned that the match continued, and indeed expanded, well into the AM when it was joined by another bear. 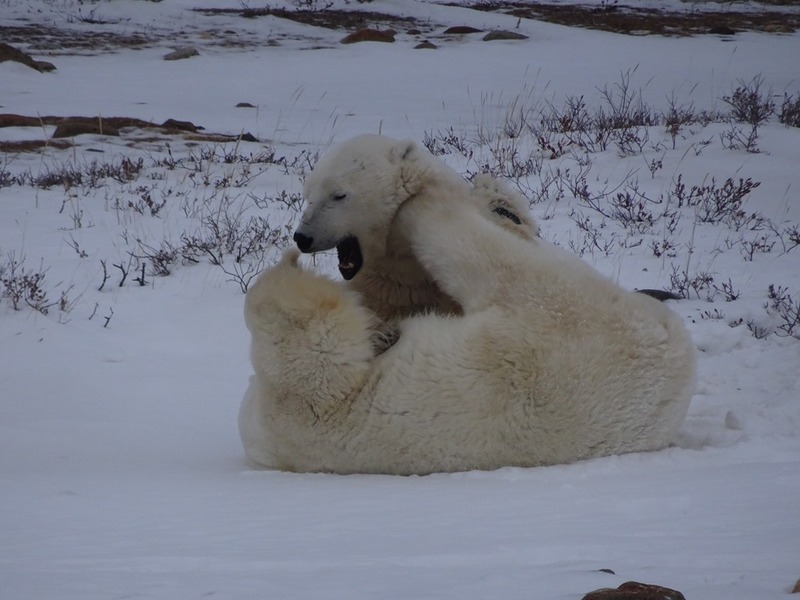 While only two fought at the same time, with the other resting and watching the contest, the match continued among different combinations of the bears. At the next morning’s breakfast we were told that this match, or most likely a new one, was taking place a short distance from the lodge. We piled into our buggy and were off again. What we found was a delicate ballet, two males, circling around and scoping each other out. One then laid down, with the other, apparently trying to coax the other on, nudging and nuzzling him. After a while, he eventually got his way, with the other rising and engaging in a short, half-hearted match after which they laid down together. Their rest, however, was short. 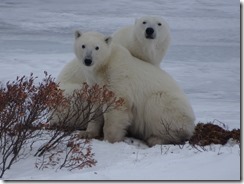 They both returned to attention when a third bear, also anxious for a match, arrived on the scene. That led to yet another minuet; more rests and then, after the third gave up and began to move away, one began to follow him into a willow patch. 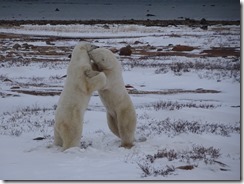 After a while, they began a short sparring match. The third bear followed and soon after, a fourth arrived on the scene, looking to get in on the action. This, effort, however, fizzled and all four ended up going their own way. Day three continued with more wild life: bears, of course; including a small, three year-old, a mother and cub and many others. 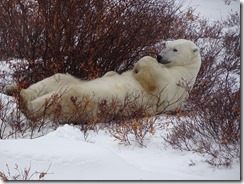 You can visit the Churchill Wildlife Management Area in two ways. 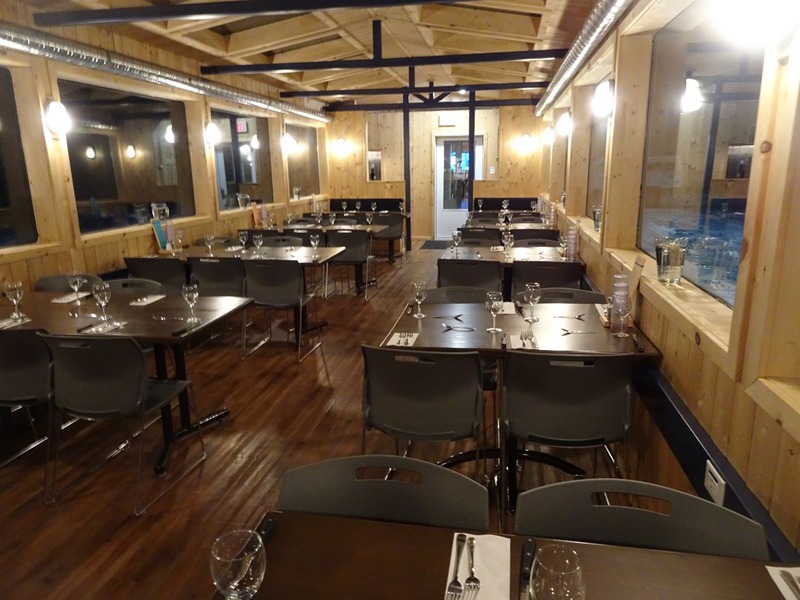 You can take day trips from Churchill, adding several hours of travel time and you miss out on any night life. 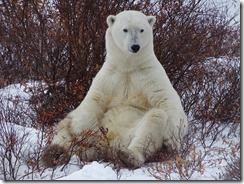 Or you can stay on the tundra in a tundra buggy lodge. We chose the latter. 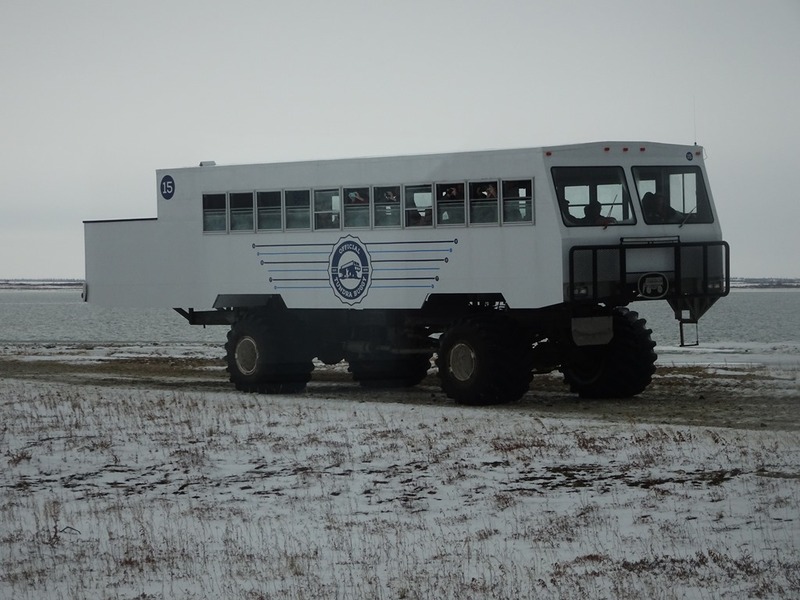 Only two buggy lodges are allowed in the conservation area, one in view of the shore and ours which was more in the middle of the tundra giving us great evening wildlife entertainment. On our first night, we had a curious bear come visit. You can see how far off the ground we had to be to be safe. 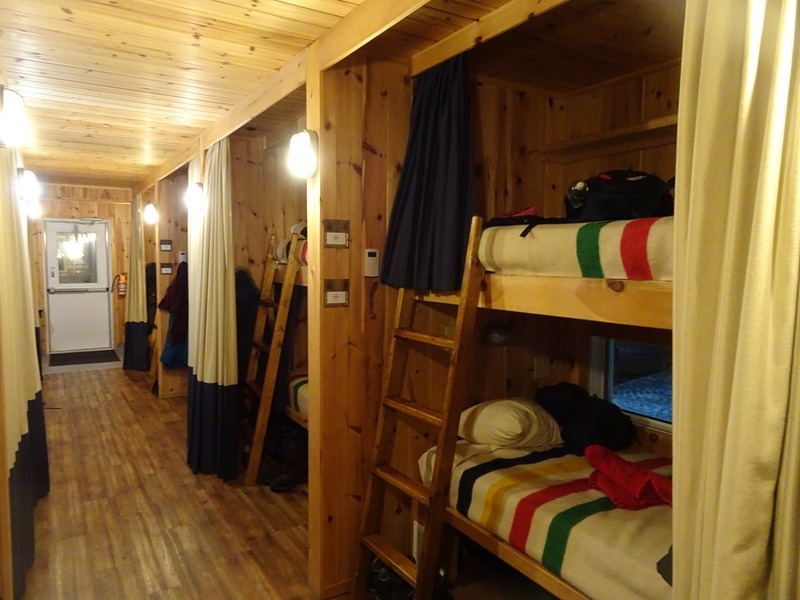 Our lovely, six-car specialized buggy lodge had two spacious “bunk” rooms cars that could accommodate 20 people each. 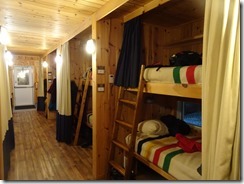 Each bunk had a privacy curtain with a second curtain that reached from the ceiling to the floor. Each individual bunk had its own viewing window, lights and electrical outlets. We could theoretically also control our own heat. In reality, you could turn up your heat but not turn it down. A lounge, a dining room, a kitchen and a staff bunk completed our “buggy train”. 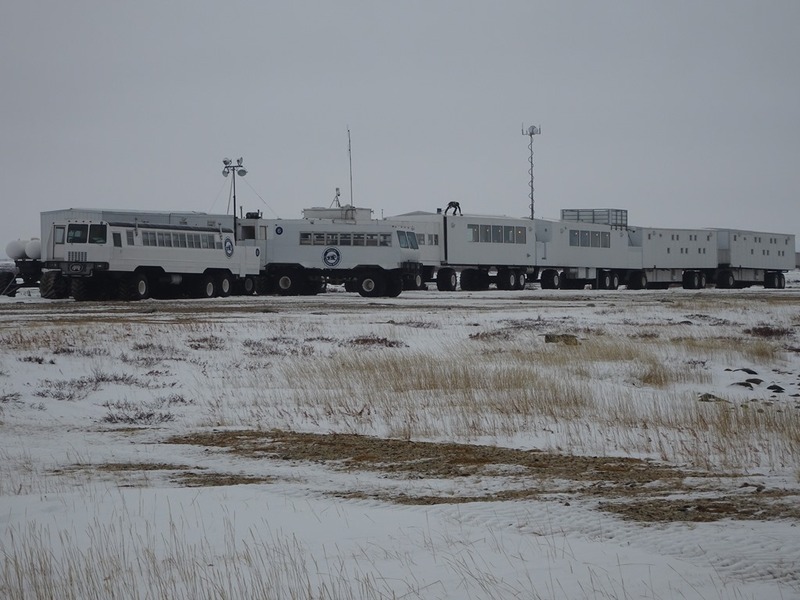 Between these units, we had docking stations to allow us to get on and off the the tundra buggies without stepping on the grounds. The 40-passenger lodge literally had all the comforts of home, except for only having three bathrooms, and two showers, for every twenty people. We soon fell into our own routines of trying to figure out the best time to take a short shower. Meals were very good and plentiful. While breakfast was served buffet styles (fruit, juice, cereal, eggs, pancakes, etc. 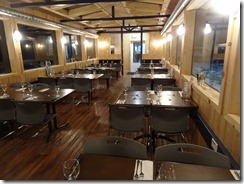 ), dinners were a more elaborate affair—sit-down, three-course dinners, often with interesting preparations and even many locally-sourced ingredients including locally-grown arugula, tundra cranberry vinaigrette with goat cheese, glazed, roasted carrots and a delicious perfectly-cooked arctic char. Other dishes included pork loin (again perfectly cooked) with parsnip puree and verjus and elk tenderloin with carrot puree and mushroom sauce. Food allergies and preferences (such as liking rare meat) were all accommodated with a smile. Desserts, including lemon curd with meringue and blackberry sauce topped with crumble and strawberry shortcake with raspberry reduction and candied pecans were just as interesting. 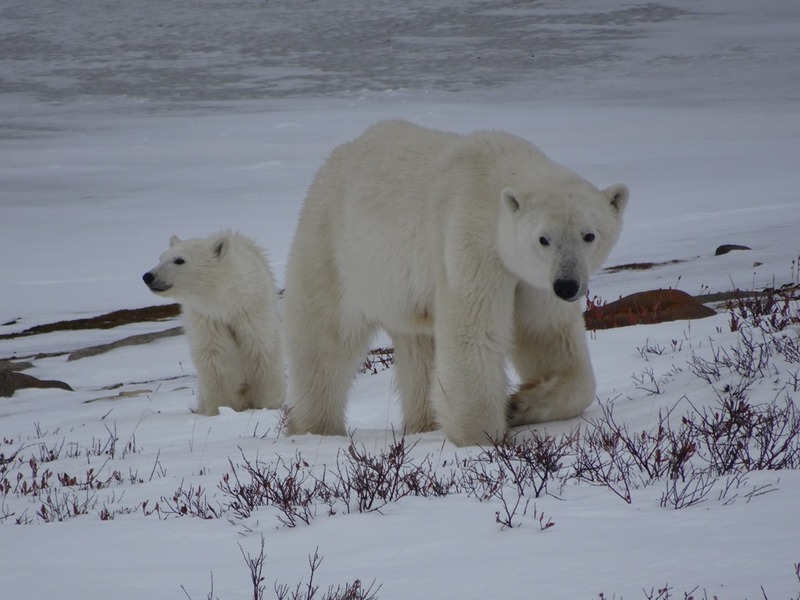 The only drawback was that all this comfort and food came with no opportunity to exercise, and since it is too damaging and potentially dangerous to step out onto the tundra, there is no opportunity to walk, except within and among the lodge units. 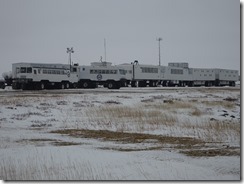 If you ever decide to take this trip, and can afford it, stay in the tundra buggy lodge. It greatly enhances the entire experience.